KaseoDip wrote: "feel bad for me.." " Why does everyone hate me?" "GIVE ME A CHANCE!" "I'm trying to do good!!" yo fr how many more times do people need to get stuck in Davalos bales for them to get fixed? Bryce im not sure what your problem is. Why would you pull a move like this on the first lap?? 10th to 17th, last lap. Loooooove Davalos bales. granted its my fault for going for a stupid line last lap. BTW loooove getting 5th in the 1st main then getting the gate I qualified in 17th in. Plz fix. Look, in the LCQ situation, DeRoco was just wrong. Doesn't matter which way you slice it, he missed UID grab. He can yell and scream that he was there but I know how a UID grab works and it works 100% of the time someone's in the server. Every time I ran a race and someone yelled at me that they were here, it was super easy to check the log files and figure out that no, they were in fact not there. Parade laps are great for figuring stuff like that out. The 3rd lap of the race isn't. But hey, we all make mistakes. It's really all good if you handle it the right way. The right way is to announce what happened, what you are trying to fix and when you realize you done messed up, apologize for your mistake and explain your line of thinking. I never saw Dunivant chat, but when you have server power, you broadcast stuff like that. I'm fine if that's the mistake you made, just own it man. I was more frustrated with Peter, and in general, others who were not accepting to the fact that people were going to be mad. "Of course, people who have never helped out before are bitching." I ran the races at one point Peter. I know that situation could have been handled better. I know it's not going to be perfect but I think there's ways you guys should rethink that situation for the future. That's all. What happened to the good old days when I could qualify 5 seconds slower than first and still be lower 30s in qualifying? 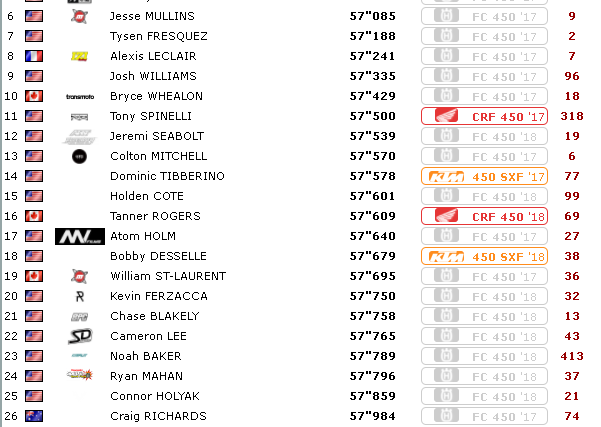 Crazy how close everyone is..
Look, in the LCQ situation, DeRoco was just wrong. Doesn't matter which way you slice it, he missed UID grab. He can yell and scream that he was there but I know how a UID grab works and it works 100% of the time someone's in the server. Yamahaulin wrote: Bryce im not sure what your problem is. Why would you pull a move like this on the first lap?? My bad dude, I know this aint no excuse but I lost my head. I didn't intend to be that dirty. You pushed me to the top of the berm before the other triple and then crossed through those whoops pretty gnarly and I sent it in a little too hard. Sorry about that, good racing tonight. Thanks for hosting guys, really enjoying the erode and I thought these starter ruts were sick. Anyone have the 250 Lcq demo? Well clearly they did double check, they restarted a race three laps deep thinking they could fix the problem. I think Chase actually was trying to do the right think but he got caught in a wormhole of his own problems really. Did DeRoco speak up during warm up? If he did, then Chase deserves the blame for the LCQ restart. Did DeRoco wait to start spamming chat until the actual race? Then he's the one who wasn't paying attention and it ended up costing Chase, who had done everything right and was in the race trying to just have his own fun. Again, I don't know the exact tools EMF has versus what I've used, but a UID grab is completely the same across the board and I don't think it was an accident Rhys Harris (41st qualifier) ended up in the LCQ and DeRoco didn't. If someone who had raced the Consi ended up in the LCQ, then I would feel the scripts malfunctioned. Some of the starter ruts were nice but the 2 before the triple just made it hard to go inside and get on the gas or you'd just slide out, The ones on the inside after the finish were useless also. Wilson156 wrote: Anyone have the 250 Lcq demo?